I move that this Bill now be read a second time. Tonight, I announce that the Budget is back in the black and Australia is back on track. For the first time in 12 years, our nation is again paying its own way. We have made real progress, but we know the job is not done. Australia is stronger than it was when we came to government six years ago. There are fewer people on welfare. There are a record number of Australians with a job. School and hospital funding are at record levels. And the Budget is stronger. But Australia does face some serious challenges. The global economy is slowing. Communities are feeling the impacts of flood, fire and drought. Families face cost of living pressures. And every one of us wants to see wages growing faster. But let me be clear: the answer to these challenges is not higher taxes. The answer is a stronger and more competitive economy, with lower taxes and more jobs. This Budget builds on our plan for a stronger economy. A stronger economy that benefits you — your family, your business, your community, your country. The plan I outline tonight does this in three ways. First, it restores our nation’s finances. Without increasing taxes. Second, it strengthens our economy and creates more jobs through a significant new skills and infrastructure agenda. Without increasing taxes. And third, it guarantees essential services like hospitals, schools and aged care, while tackling the cost of living. Our plan is shaped by our values. And our values embrace all Australians. Not just some of them. The power of aspiration and enterprise. And always providing a helping hand to those who need it. We want Australians to have a go and to get a fair go. Our commitment to fairness means the next generation not having to pick up the tab for the last. This much at least we owe to our children. So tonight, I am pleased to announce a budget surplus of $7.1 billion. A $55 billion turnaround from the deficit we inherited six years ago. In 2020-21, a surplus of $11 billion. In 2021-22, a surplus of $17.8 billion. In 2022-23, a surplus of $9.2 billion. A total of $45 billion of surpluses over the next four years. Surpluses will continue to build toward one per cent of GDP within a decade. As we climb the mountain and reach our goal of eliminating Commonwealth net debt by 2030 or sooner. Only one side of politics can do this, because only one side of politics has done this. John Howard and Peter Costello paid off Labor’s debt. And tonight the Morrison Government sets a path to do it again, without increasing taxes. This matters because over the last year the interest bill on the national debt was $18 billion. And this was in a low interest rate environment. This is money that could have built 500 schools or a world-class hospital in each state and territory. We are reducing the debt and this interest bill. Not through higher taxes, but by responsible budget management and by growing the economy. Tonight I am announcing the next stage in our economic plan to make Australia even stronger. Building more infrastructure to relieve congestion in our cities. Equipping more workers with better skills to meet future needs. Because we want Australians to earn more and to keep more of what they earn. That’s why last year we passed into law a three step plan to deliver $144 billion in personal income tax cuts. First, providing immediate relief to address cost of living pressures. Second, protecting income earners from bracket creep. Third, abolishing an entire tax bracket, simplifying the system, incentivising and rewarding hard work. Tonight, I can announce that we will go even further. Two significant changes will deliver $158 billion of additional tax relief for hard-working Australians. The largest personal income tax cuts since the Howard Government. The Government is more than doubling the low and middle income tax offset from 2018-19. Taxpayers earning up to $126,000 a year — including teachers, tradies and nurses — will receive a tax cut. For a single income family, this means up to $1,080 in your pocket per year. And for families on a dual income, up to $2,160. This is money that could go towards your monthly mortgage payment, your quarterly power bill or your yearly car insurance. More than 10 million taxpayers will benefit, with 4.5 million receiving the full amount. This relief will flow quickly and be available to Australians after tax returns for the 2018-19 year are submitted in 13 weeks’ time. This tax relief will lift household incomes, ease cost of living pressures and boost spending at local businesses. The second change I announce tonight delivers long-term structural reform by lowering the 32.5 per cent tax rate to 30 per cent from 1 July 2024. This will cover all taxpayers earning between $45,000 and $200,000 and will mean that 94 per cent of taxpayers will pay no more than 30 cents in the dollar. Following these changes, our tax system will remain highly progressive. With the top five per cent of taxpayers paying one third of all income tax collected. And someone earning $200,000 paying 10 times as much tax as someone on $45,000. But unlike those opposite, we believe there should be limits to the amount you are taxed. That’s why, under the Morrison Government, tax as a share of the economy will not rise above the 23.9 per cent cap. We will put a speed limit on taxes, while our opponents will put a speed limit on the economy. Mr Speaker, taxes will always be lower under the Coalition. And tonight, I also announce additional tax relief for small and medium-sized businesses. Small businesses are the engine-room of our economy. They are integral to every local community. People running a small business put their livelihoods on the line. They start early and finish late. They manage the front desk and the back office. They pay their workers first and take their own wages last. We want small businesses to prosper, and we are backing them to do so. Cutting their taxes to 25 per cent. Increasing their access to finance with a new $2 billion fund. Ensuring small business is paid on time, both by government and big business. And from tonight the instant asset write-off will be increased and expanded. It will be increased from $25,000 to $30,000, and it can be used every time an asset under that amount is purchased. Allowing a café to get a new fridge or grill, a plumber to buy new tools or a courier a new van. The instant asset write-off will also be expanded to businesses with a turnover of up to $50 million. This will cover an additional 22,000 businesses, employing 1.7 million Australians. Already more than 350,000 businesses have taken up the instant asset write-off. And now, even more will have the chance to do so. Businesses are also benefiting from the free trade agreements this Government has secured. China, Japan, Korea, the Trans-Pacific Partnership and now Indonesia. Tonight, we provide an additional $60 million for Export Market Development Grants to allow small and medium-sized businesses to capitalise on those opportunities. Mr Speaker, we believe in lower taxes but we also believe everyone should pay their fair share. This Government has been at the forefront of global efforts to crack down on multinational tax avoidance. We have implemented tough new laws, which helped raise more than $12 billion. Tonight we provide additional support to the Tax Office to continue these efforts. We also provide additional resources to our financial regulators following the Banking Royal Commission. This will strengthen the financial system and deliver better outcomes for all Australians. Mr Speaker, a strong economy requires lower taxes. A strong economy depends on small business. A strong economy needs ongoing investment in roads, rail, bridges, dams and ports. Tonight, I can announce that the Coalition Government is boosting our infrastructure spending to $100 billion over the decade. Cranes, hard hats and heavy machinery will be seen across the country, as we build Australia for current and future generations. To ease congestion in our cities. To unlock the potential of our regions. To better manage population growth. To improve safety on our roads. We know you want to be there for the school drop off, to help the kids with their homework and spend more time together at the dinner table. Tonight, I announce we are increasing the Urban Congestion Fund four-fold from $1 billion to $4 billion. This fund will focus on immediate, practical measures to cut travel times within our cities. Removing bottlenecks and improving travel corridors. It will include a $500 million Commuter Car Park Fund that will improve access to public transport hubs and take tens of thousands of cars off our roads. Central to our plan is a long-term fast-rail vision for Australia. To make this vision a reality, we are providing $2 billion in this Budget for fast-rail between Melbourne and Geelong, slashing travel times in half. Sydney to Wollongong, Newcastle, Bathurst, Orange and Parkes. Brisbane to the Sunshine Coast and Gold Coast. Melbourne to Shepparton, Traralgon and Wodonga. We are getting on with the job of building infrastructure. 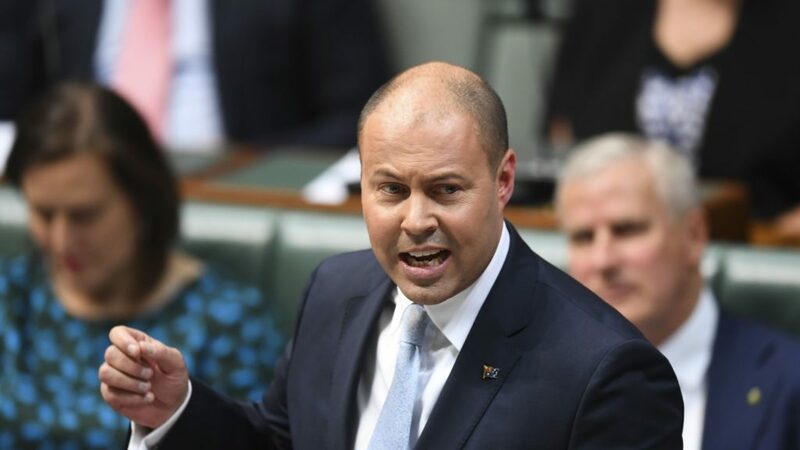 With funding in this Budget for the Tonkin Highway in Perth, the North-South corridor in Adelaide, the Gateway Motorway in Brisbane and the Freight Rail Revitalisation Program in Tasmania. It was this Government that ended 50 years of indecision and started construction on the Nancy-Bird Walton Airport in Western Sydney. It was this Government that committed $5 billion to build the Melbourne airport rail link. And it is this Government which is investing $1.4 billion to build Snowy 2.0. Modernising a national icon and building on the vision of Menzies and Chifley. Mr Speaker, our regions and their vitality have always shaped the Australian story. $2.2 billion for safer roads. $1 billion to improve freight routes and access to ports. $100 million for regional airports. These investments make our regions stronger and our country stronger. Over the past year drought and flood have taken a heavy toll on our agricultural towns and communities. These communities have shown strength and resilience, as all Australians have stood with them. The Morrison Government is providing $6.3 billion in drought support and $3.3 billion for those affected by flood. Expanding the National Water Infrastructure Development Fund. Establishing the Future Drought Fund. And supporting graziers through a new North Queensland Livestock Industry Recovery Agency. Tonight I can announce we will establish a new $3.9 billion Emergency Response Fund that will ensure additional resourcing is available to support future natural disaster recovery efforts. Agriculture, like the other primary industries that helped build this country, must be recognised and valued. Our economic plan is about driving all industries forward, not just the new ones. Mr Speaker, our people are our most valuable asset. We need to ensure all Australians of all ages have the skills they need for the jobs of today and the jobs of tomorrow. Tonight I announce a new $525 million skills package. We will create 80,000 new apprenticeships in industries with skills shortages. We will double incentive payments to employers to $8,000 per placement. And these new apprentices — including bakers, bricklayers, carpenters and plumbers — will also receive a $2,000 incentive payment. We announce tonight ten new training hubs connecting schools, local industries and young people in regional areas with high youth unemployment. We are also investing $62 million to boost literacy, numeracy and digital skills. And refocusing the job services model to provide more personalised support for disadvantaged job seekers. Mr Speaker, young Australians should have every chance of success when it comes to career opportunities in the digital age. Tonight we provide further funding to increase participation for women and girls in STEM. Complementing our Future Female Entrepreneurs Program, which is supporting 55,000 young women. We are also backing the industries of the future. We’re investing $9 billion this year in science, research and technology, including its commercialisation. And we established the $20 billion Medical Research Future Fund, with dividends going to new clinical trials and research into areas such as tuberculosis and traumatic brain injury. There is also more than $400 million in this Budget for genomics research to unlock the secrets of our DNA. And $160 million for research to improve the health of Indigenous Australians. Mr Speaker, as I said in my first speech in this place, education is the first defence of the nation. It is critical to our prosperity, harmony and advancement as a country. While money is important, so too is the quality of education afforded to all Australians. Under our Government, funding for public, independent and Catholic schools is at an all-time high and will continue to grow substantially in the decade ahead. We are committing around $300 billion to all schools, a total increase of 63 per cent. This is a real dividend from a strong economy and comes without increasing taxes. No one knows the needs of a local school better than the school community itself, its parents and teachers. So tonight’s Budget includes a new local school community program. Funding will be available for projects such as upgrades to libraries, classrooms and play equipment. This Budget includes a new scholarship program for over 1,000 students a year to study in regional Australia. We want our children to get the best possible start in life. So tonight, I am announcing $453 million to once again extend pre-school education, enabling 350,000 children to receive 15 hours of quality early learning per week in the year before school. We will continue to work with the states and territories to support a longer-term plan. Lower taxes, more infrastructure, better skills and a quality education. This is our plan for a stronger economy that will help our nation reach its potential and enable every Australian to reach theirs. Mr Speaker, a strong economy is not an end in itself. It’s what you do with it that counts. With a strong economy, we can guarantee the essential services that Australians need and deserve. Health is front of mind for all Australians, and this year the Government will spend more than $80 billion on healthcare. An amount that has increased every year we have been in government. More life-changing medicines on the PBS. More funding for mental health. Better access to dental services. And better access to regional GPs. Funding upgrades to regional hospitals, the first being in Townsville. Establishing Australia’s first comprehensive children’s cancer centre in Sydney. Helping to build a new Brain and Spinal Ward in South Australia. In this Budget, we also list more medicines on the PBS to treat kidney, bladder, liver and skin cancer. And tonight, we announce the listing of Besponsa, a medicine for people with acute Leukaemia. Instead of costing $120,000 a course, patients will now have access to the medicine at a cost of only $6.50 per script for concession card holders and around $40 for general patients. This brings the total number of new listings to more than 2,000 since we came to government, costing more than $10 billion. A real and profound dividend from a strong economy, and done without increasing taxes. Under the Coalition, Medicare is guaranteed. Bulk-billing is at a record high. And we are adding new services to the Medicare Benefits Schedule, including diagnostic imaging for breast cancer and heart health checks. We’re establishing a Heart Kids Project for new research to treat and prevent heart disease which affects thousands of Australian children. We must work together to combat youth suicide as a national priority. In this Budget, the Government will invest $461 million in Australia’s most significant youth mental health and suicide prevention strategy. More support for Indigenous youth including through mentoring and peer support. A perinatal mental health program. And extra counselling services for communities who have suffered from natural disasters. All of this is about looking after each other. It reflects the best of Australia and its values. Mr Speaker, a stronger economy also allows us to invest more in looking after older Australians. Australians deserve to age with dignity and have earned the right to expect the highest standards of aged care services. In some cases, these services have badly let Australians down. That is why we established the Royal Commission into aged care. 10,000 new home care packages. Bringing to 40,000 the number of new packages announced over the last 18 months. Additional financial support for residential care. A capital works program with a focus on regional Australia. And a series of new measures to improve the quality and safety of aged care services. We achieve this without new taxes and without raiding retirees’ hard earned savings. Mr Speaker, we also recognise the pressure energy bills place on those who can least afford it. That’s why we are providing additional cost of living relief for pensioners through a one-off Energy Assistance Payment of $75 for singles and $125 for couples. This payment will be paid this financial year and comes on top of other actions the Government has taken to reduce power bills. Mr Speaker, we know that Australia’s carers are our nation’s unsung heroes. Their job is 24/7 and it’s emotionally as well as physically demanding. Many carers need and deserve a rest. So tonight we are announcing $84 million to enable carers to leave a loved one in safe hands and get a much needed break. Mr Speaker, supporting people with disability is a moral imperative, recognised by both sides of politics. Growing to $22 billion, it takes a strong economy to fund the NDIS fully and sustainably. This is what our Government has done. In this Budget, we have also set aside half a billion dollars for a Royal Commission into the mistreatment of people with disability. Affordable housing is also a priority for this Government. Just over a week ago, the National Housing Finance and Investment Corporation, established by this Government, successfully issued the largest social bond in Australia’s history. Over $300 million was raised, providing a significant injection into the community housing sector. Mr Speaker, we all have an important responsibility to protect our environment and address climate change. This Budget includes a $3.5 billion Climate Solutions Package — $2 billion of which will go to practical emission reduction activities, working with farmers and Indigenous communities. Through our measures, as we have done in the past, we will beat our international emission reduction targets. Australians have been gifted a precious inheritance. Tonight I announce a $100 million Environment Restoration Fund to deliver large-scale environmental projects. Protecting the habitats of our threatened species, our coasts, our waterways and cleaning up waste. It will complement a new Communities Environment Program, providing smaller grants for projects that target local community priorities. Mr Speaker, all Australians have a right to feel safe in their community. In the largest Commonwealth investment in women’s safety, in this Budget we are providing $328 million to fund prevention, response and recovery initiatives. Bringing our total investment in this area to $840 million since we came to government. There is new funding for the 1800RESPECT helpline, more safe places and training for health and other service providers. But we must also change attitudes as the path to violence begins with disrespect. This Budget also provides for a new round of the Safer Communities Fund, assisting religious organisations, schools and other organisations to install fencing, lighting and security cameras. We also have to do more to keep our kids safe online and tackle cyber-bullying. Just as we teach our kids how to cross the street, we now need to teach them how to sensibly and safely use the web. In this Budget, we are funding new practical training to give kids, parents and teachers the knowledge and skills necessary to keep our children safe online. Mr Speaker, the Government’s cashless debit card is delivering life-changing outcomes in child welfare and the safety of communities. And so, in this Budget, we extend its roll out. It is already making a real difference, almost halving the frequency of alcohol consumption, gambling and drug abuse. Mr Speaker, drugs like ice and heroin have a devastating impact on families. Tonight, we announce $337 million in new funding for our comprehensive drug strategy. Cracking down on outlaw motorcycle gangs and their drug supply chains. And improving treatment and rehabilitation services to support those affected by the scourge of drugs. Our law enforcement agencies are also on the front line of countering terrorism and extremism. We are providing the Federal Police and ASIO with $570 million to keep Australians safe from these threats. In this Budget, we are also allocating an additional $680 million to support our service men and women deployed abroad. Mr Speaker, our Government also recognises the importance of supporting our veterans. They have served our nation, defending our values and our interests. That’s why we are adding to the $278 million invested in our last two Budgets to improve the wellbeing of our veterans and their families. Mr Speaker, the fundamentals of the Australian economy are sound, but there are genuine and clear risks emerging both at home and abroad. The residential housing market has cooled, credit growth has eased and we are yet to see the full impact of flood and drought on the economy. Global trade tensions remain, the Chinese economy has slowed and there has been a loss of momentum in Japan, Europe and other advanced economies. Notwithstanding these challenges, it is a testament to the strength of the Australian economy that it is in its 28th year of consecutive economic growth. Our economic plan will see this continue. GDP growth is expected to pick up to 2¾ per cent in 2019-20. We delivered ahead of schedule on our promise to create one million new jobs. And now commit to creating a further 1.25 million new jobs over the next five years. The economy was weakening, unemployment was rising and the budget was deteriorating. Since then, we have made the right choices, the difficult but necessary choices and our economic plan is working. Tonight marks the next stage in that plan. The first surplus in 12 years, and the first repayment made on Labor’s debt. Lower taxes for 10 million Australians and three million small businesses. A $100 billion National Infrastructure Plan. Record spending on schools and hospitals. We have done all of this without increasing taxes. Under the Coalition, our borders will always be more secure. Mr Speaker, tonight we have set the course for an even better and brighter Australia. Putting the Budget to the crash test: What’s in it for you?